I dub the system “BUGS” – BackUp Grenade Slingshot. I wonder what the story behind the picture is? 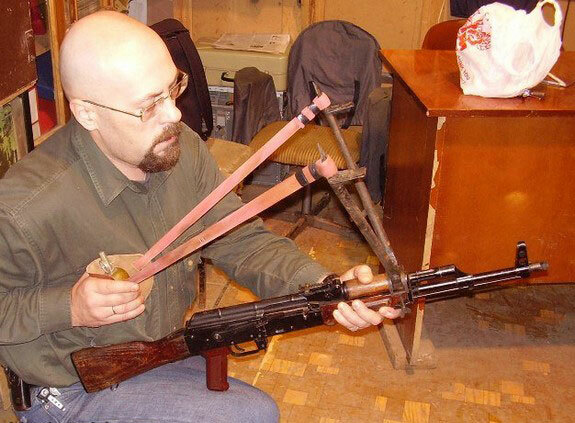 Doesn’t seem sophisticated enough to be Russian… probably some Taliban jury rigging. And it is western, probably US. Folding knife in the pocket and Leatherman on the waist. No! This is russian man. Siberia. This man wont hunted the bear. Sorry, i am not perfekt speak your berberian language. Siberia’s in a heart every Russian man! The desk seems to be secured to the floor, as if it’s in a ship’s cabin. Possibly a captured pirate’s AK? That’s not secured to the floor, it’s an example of Southern Engineering desk leveling. Just blocks to raise the desk up. Us tall people do it often. I’d say it’s most likely a Taliban capture, the setting certainly looks dusty enough. I think we may be reading to much into it. It’s probably just something the guy did for a funny joke/picture.